What's in this Article ? AFCAT 1 2017 Notification, Apply Online & Exam Date @ careerairforce.nic.in Age Limit, Application Form, Eligibility, Syllabus, Question Paper, Exam Ques. Indian air force (IAF) released recruitment notification on 4th June 2016 about the filling up of applications for the posts of flight lieutenant posts through air force common aptitude test (AFCAT). previously afcat 1 examination was conducted throughout the country. lac’s of students appeared in the exam, the draw back was the org. did not leak the question papers, so candidates who all applied and appeared couldn’t able to check how much questions they attempted were correct. this attempt lets see what happen about the AFCAT 1 2017 Examination soon. The Below given table completely describes about notification date, date of application, last date to apply for the airforce test. Date of examination and Date of results etc. The Age limit for AFCAT Examination is Starting from 20, the upper limit varies for different branches. Exam Pattern: One common test of 100 questions, to be solved by all candidates in 2 hours. Technical Branch candidates have an addition test of EKT, both tests are objective. Successful candidates get a chance to appear for AFSB, and recommended candidates can be called for training based on their rank in the merit list and subject to medical fitness. Name of the Organization: Indian Air Force (IAF). Name of the exam: Air Force Common Aptitude Test (AFCAT). Job Category: central Government job. examination location: All over the india. Last Date: 28th july 2016.
date of result: 28th Sep 2016.
release date of notification: 4th June 2016. 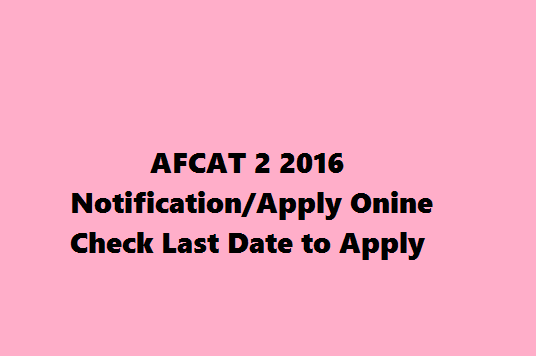 AFCAT 1 2017 Notification Apply Online & Exam Date Air Force Common Admission Test Has Released Notification For Written Examination Which Will Be Conducted in the Month Of February 2016. Candidates Are Requested to Check Age Limit, Who Can Apply, Eligibility, Educational Qualification Required and Criteria of Examination and How to Apply. Indian Air Force conducts Air Force Common Admission Test, popularly known as AFCAT, twice every year. As the name suggests this test is conduct for and by Indian Air Force. The purpose of this test is to recruit officers (both men and women) for three branches (and their sub branches) of Air Force namely Flying, Technical and Ground Duty. Aeronautical Society of India with 60% marks for Technical Branch and Graduation with 60% marks/Graduation Degree in Commerce/Post Graduation Degree/Diploma in any discipline/CA/ICWA with 50% marks for Ground Duty Branch. Age Limit: The candidates age limit should be in between 20-24 years for Flying Branch, 20-26 years for Technical Branch & Ground Duty Branch as on 01-07-2017. The age relaxation is applicable up to 26 years of age for Flying Branch as per rules. Selection Process: The candidates is selected based on the achievement in Engineering Knowledge Test (EKT) and AFCAT ( for the candidates who are applied for technical branch post only) which is followed by the Medical Test, Psychological Test, Group Test, Intelligence Test and Interview. The candidates can apply for the posts from 5th December to 31st December 2015 and they can download the admit card on the official website as soon the officials release it on the website. Exam Date: Last Sunday of 21 February 2016. Results: The results for AFCAT 1 2016 can be expected by end of March 2016. The questions asked in the common test contain basic Mathematics, English, Science, Geography, History, Current Affairs and Reasoning. EKT has basics of engineering. You can download the previous year’s question papers from the career website of IAF. hi, this examination is for graduates and post graduates. check your age limit and apply for cds 2 through that you can get into airforce, army and navy. Copyright & All rights reserved Examsleague 2019. Content copyrighted. Reproduction Denied. About Us.